In this edition of Graphic Intelligence, we sort Canadians according to their mid-career earnings and then make comparisons of the top earners to the bottom earners and see who is living longer..
Our recent C.D. Howe report provides new evidence on the incomes and longevity of Canadians. 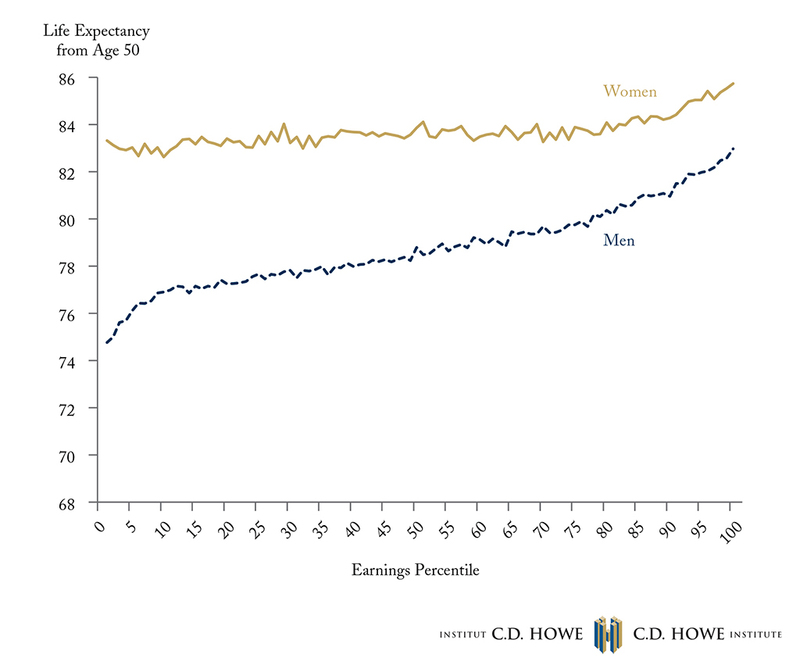 For men, we find that those in the top one percent of earners are living eight years longer than those in the bottom one percent of earners; this gap represents about a ten percent difference in lifespan, from 75 to 83. For women, the gap is about three years, from 83 to 85. These new facts point to important lessons in understanding Canadian pensions, since some Canadians will systematically receive more than others over their lifespans. We should evaluate pension policy changes in the light of differential lifespans across earnings groups. To learn more about the correlation between incomes and the longevity of Canadians, as well as how that compares to the U.S., read “Rich Man, Poor Man: The Policy Implications of Canadians Living Longer” by Kevin Milligan and Tammy Schirle.